Inspired by the off-road tradition of the Wrangler Rubicon, the 2020 Jeep Gladiator midsize pickup truck revealed Wednesday at the Los Angeles Auto Show is the brand’s first pickup in nearly three decades. Jeep sees an opportunity to add sales in the growing midsize pickup truck segment with a vehicle clearly intended for weekend adventurers who like to crawl over rocks and ford streams. The Gladiator enters a crowded market dominated by the Toyota Tacoma and Chevrolet Colorado. Both offer off-road variants but sell mostly as work and daily driver trucks. The competition will become even tougher early next year when Ford brings its midsize Ranger pickup back to the U.S. market after an eight-year absence. The Gladiator goes on sale a few months later. “Gladiator is very much a lifestyle product, and people will be willing to pay a lot of money for it,” said Ed Kim, an analyst with AutoPacific, an industry consulting firm. Sales of midsize pickups have risen 17.6 percent through the first 10 months of this year compared with the same period a year earlier. They are on pace to reach 500,000 sales this year. Sales of full-size pickups are up just 1 percent. Midsize pickups have doubled in sales over the last four years but may be reaching the end of their growth cycle, said Stephanie Brinley, an analyst with IHS Markit. IHS estimates that sales of 500,000 units may be near the top of the market. A Jeep pickup truck “has been on the bucket list forever,” said Mark Allen, head of Jeep Design. The truck gets its power from a 3.6-liter Pentastar engine that generates up to 285 horsepower and 260 pound-feet of torque. It is mated to an eight-speed automatic transmission. A six-speed manual is also available. The Gladiator’s maximum towing and payload numbers flirt with segment benchmarks. The truck is capable of towing 7,650 pounds with a 1,600-pound payload. The Tacoma can carry 20 more pounds. A 2.8-liter diesel available in the Chevrolet Colorado can drag 7,700 pounds. Jeep also will offer a 3.0-liter EcoDiesel engine for the Gladiator. 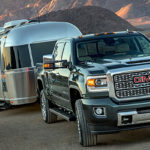 It was most recently offered in the Ram 1500 full-size pickup and the Jeep Grand Cherokee. It will produce up to 260 horsepower and 442 pound-feet of torque when it arrives in 2020, according to Pete Milosavlevski, chief engineer for the Gladiator. It will be packaged with an eight-speed automatic transmission. All Gladiator models adopt Wrangler’s styling. It has the same seven-slat grille, round headlights, square taillights and high ground clearance. It also offers the unique fold-down windshield, removable doors and roof. Like the Wrangler the Gladiator has steep approach and rear departure angles. Gladiator Overland and Rubicon models share an available three-piece body-color hardtop option. A black three-piece hardtop with a manual rear sliding window is available on all models. The high-strength steel bed can hold 20 sheets of drywall, mountain bikes or other outdoor toys. Jeep will offer an optional tonneau cover that rolls up tightly, allowing access to most of the bed. In addition, the tailgate locks in a mid-range position, allowing two-by-fours or other lengthy cargo to extend beyond the bed length. The Gladiator has a 137-inch wheelbase. It rides on 17-inch wheels and 32-inch tires. The Rubicon comes with 18-inch wheels and standard 33-inch off-road tires. It can accommodate aftermarket 35-inch tires. The front suspension is shared with Wrangler, as are the doors, hood and powertrain. The Gladiator’s frame to the rear of the truck is unique. Overall, the Wrangler and Gladiator share less than 50 percent common parts. The Gladiator is about 400 pounds heavier than the Wrangler because of beefier components, including heavy-duty forged front and rear Dana 44 axles. The brand’s last pickup, the Comanche, was sold from 1986 to 1992. Gladiator was first used on a Jeep pickup that debuted in 1962. But its name was changed to the J-Series after 1971 until it went out of production in 1988. The Gladiator comes in four variations: the entry-level Sport, the towing-oriented Sport S, the luxury-oriented Overland and the premium off-road-ready Rubicon. Only four-door crew cabs are offered. Prices will be announced in the first quarter of 2019. Jeep is counting on customers trusting its brand reputation and history of 4×4 off-roading excellence. The original Willy’s Jeep earned praise during World War II for transporting soldiers on the battlefield. “Now we’ve got a vehicle that can go anywhere, do anything with your stuff, and bring you back,” said Tim Kuniskis, head of the Jeep brand. Off road, the Gladiator Rubicon has up to an 84.2:1 crawl ratio with a 43.6-degree approach angle and 26-degree rear departure angle. Front and rear tow hooks are standard for getting unstuck from a tight spot. A winch-ready front steel bumper is an option on the Rubicon model. Removable end caps direct rock impacts to the front tires instead of the bumper. With its 11.1-inch ground clearance, the Gladiator can ford 30 inches of water. The hood features a foreword-facing trail camera allowing the driver to see obstacles as close as two feet from the truck. It includes a washer to remove dust and dirt. Because of the Gladiator’s removable top, a place to secure store gear was important. Optional lockable storage is situated under the rear seat cushion, which flips to a stadium position for easy access. The 60-40 seats also fold flat, which allows lockable storage of smaller items behind them. The seat retractors are bolted to the seat frame to avoid interference from safety belts while accessing the storage compartments. A smart-charging, removable Bluetooth speaker for camping and tailgating is nestled behind the left passenger seat. Passenger comforts include dual climate control, adjustable lumbar support and soft door bolsters that permit arm placement on top of the bolster or on the armrest. The door panel interior is designed to ease lifting the door for removal. The Gladiator offers real-time performance data via a 7- or 8.4-inch touchscreen powered by FCA’s UConnect infotainment system. Tabs include drivetrain that covers the status of front and rear locking differentials and transfer case mode. A pitch-and-roll tab shows the Gladiator’s position dynamically and numerically. Another shows the view from the forward-facing camera. Within the infotainment system is a feature called selectable tire fill alert. Because off-roaders deflate their tires for better friction on rock and gravel, Jeep engineers tied the tire pressure sensors to the horn, signaling the driver when the desired tire pressure is reached. More than 200 Mopar accessories are available for the Gladiator, many carried over from Wrangler like 7-inch LED lights that attach to the sides of the windshield in the lowered position or across the top when raised. Jeep sells $1,000 in accessories on every Wrangler and expects the same or more to be spent on the Gladiator. What are the interior dimensions of the bed?